Have a custom bridge made. Let’s just ignore the first option, because to keep your remaining teeth from shifting, something has to be done. If you can afford it, dental implants are now considered the best possible solution for missing teeth. The implant procedure, however, does take longer to complete. If you want a speedy, less expensive and relatively lasting solution, the answer is a dental bridge. Your Placerville dentist will discuss your options during an initial consultation. Just as a bridge can span a river or a highway, a dental bridge unites your teeth on each side of an open space. A dental bridge is really just a set of replacement teeth that are permanently connected. To fit your bridge snugly, they are usually attached with two crowns, one on either side of the gap. This does mean that the two teeth receiving the crowns are shaped to fit, so the decision to get a bridge is a permanent one. 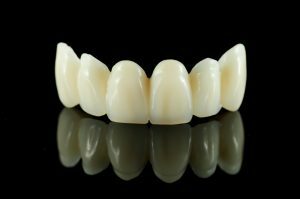 Like crowns, a bridge can be made from a variety of durable materials to match the color of your existing teeth. With a bridge, your healthy teeth should stay where they belong, instead of shifting and creating more gaps in your teeth. Bridges let you to smile from ear to ear, chew the foods you love and speak clearly, just as you did before you lost your teeth. A dental bridge is traditionally fixed in place and cannot be removed, ensuring years of stable use. They may also take the shape of partial dentures, or be installed with implants. The advantage to the implant procedure is that it preserves the underlying jaw bone. If you have lost a number of teeth, and cannot afford to replace them all with implants, just a few implants can support a dental bridge. Although it takes time for your implants to integrate with your jawbone, your surrounding teeth require no alterations for an implant bridge. We install a temporary bridge while your implants become part of your jaw. During the two or more visits required for whichever type of bridge you choose, the Placerville Dental Group won’t let you leave the office with large gaps in your smile, not even temporarily! Would You Like to Buy a Bridge? Make an appointment to discuss the options for bridging the gap in your teeth. Before you know it, The Gap will just be a place to shop, not a space between your teeth!